Nikita Lyutikov was born in 1991 in Saint Petersburg. In 1998 he started his music education in the fortepiano class in a local music school. From 2002 till 2009 he attended a secondary special music college under the Saint-Petersburg Conservatory (class Andrey Bol’shiyanov). He graduated the Saint-Petersburg State Conservatory of N.A. Rimsky-Korsakov (class of professor Andrey Kazakov). From 2014 he is a soloist of the symphony orchestra in the D.D. Shostakovich Saint-Petersburg academic philharmonia. 2003 - grand-prix in the international competition “Art of the XXI Century” (Kiev-Vorzel). 2005 - grand-prix in the II Moscow open competition of young clarinettists and wind ensembles. 2005 – laureate of the Yuriy Temirkanov prize. 2006 - laureate of the I prize and "Intonation" award of the Saint-Petersburg Music House in the V International Youth Competition in the name of Evgeniy Mavrinskiy (Saint Petersburg). 2007 – laureate of the I prize in the IV international competition of wind instruments (Long Island, New York). 2011 – laureate of the II prize in the Russian-German competition of performers on the wooden wind instruments of the Garts’ Charity Fund. 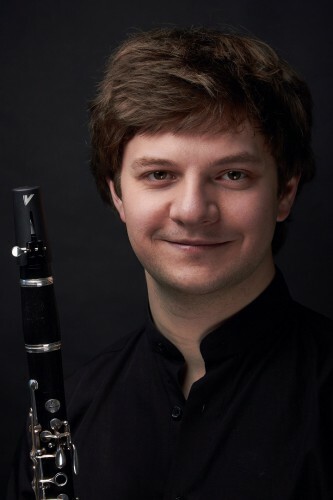 2015 - laureate of the II prize in 3rd International Clarinet Competition Ghent (Belgium). In 2005 Nikita Lyutikov became a grant holder of the Maestro Temirkanov International Foundation for Cultural Initiatives, and the Ministry for Culture of Russia “Young Talents”, and a grant holder of the Saint-Petersburg Music House and JSB “Russia” in 2010. He performs together with numerous symphony orchestras such as the honored group of Russian orchestra of the Saint-Petersburg Philharmonic Society, Symphony Orchestra of the Saint-Petersburg Capella, State Academic Orchestra of Saint- Petersburg, Yale University Symphony Orchestra (New York), Swedish Wind Ensemble. He plays together with such conductors as A. Titov, G. Uglov, A. Rybalko, A. Shteinluht, A. Shahmametiev, V. Sinayskiy, K. Yang. He performed in the international festival “The Square of Arts” together with the orchestra of the Saint Petersburg Philharmonic Society conducted by Yuriy Temirkanov. He performed in the festivals of the "Musical Olympus" Fund, Vladimir Spivakov Fund, as well in the concert tours of the music college in Switzerland and Germany, and appeared as a soloist in the Carnegie Hall, Saint- Petersburg Capella , Philharmonic Hall. From 2007 he is a participant of concert programs «Music Team of Russia», «River of Talents», «Music of Stars» organized by the Saint-Petersburg Music House in Saint Petersburg and other Russian regions.